The Micro Air Data System (μADS) combines the functionality of our five-hole Air Data probes with our Micro Air Data Computer (μADC) to produce a fully integrated air data system. The μADS is used to improve the stability, safety, and fuel efficiency of motor sports vehicles and unmanned aircraft by delivering accurate air data to a race team, flight controller or remote pilot in real-time. 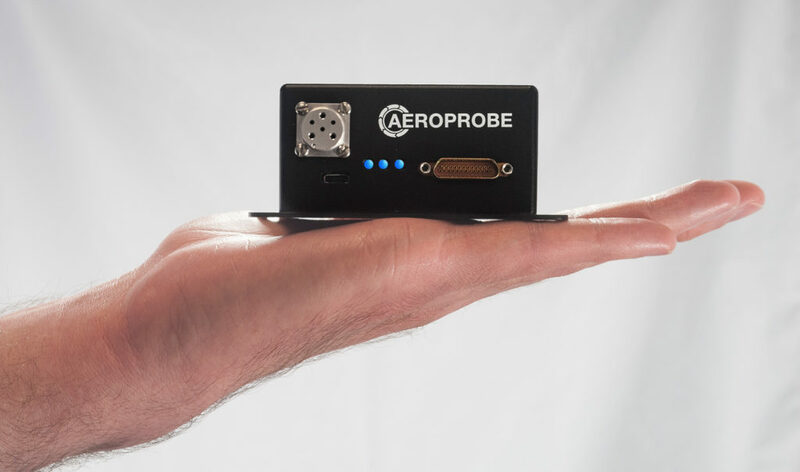 The Aeroprobe μADS has revolutionized the industry by offering a mobile solution that delivers complex air data measurements that help enable UAV to push performance and control limits. During critical high angle of attack (AoA) maneuvers, such as take-off and landing, the μADS helps pilots avoid dangerous stall conditions (when a sudden loss of lift and an increase in drag occurs) by providing real-time angle of attack information. The mobility of this system allows it to be used in remote locations to gather real-time data. For example, the wind turbine industry can evaluate wind characteristics in real time to give input on how to adjust the pitch of the turbine blades to maximize power output. The Air Data probe measures angle of attack, angle of sideslip, airspeed, and altitude within the same footprint and weight as a Pitot-Static probe. Air Data probes are available with heaters for icing protection and can be instrumented with a total air temperature (TAT) sensor. Traditional air data solutions measure angle of attack and angle of sideslip with pitch and yaw vanes that have moving parts, which increase the system’s error, weight and response time. Operating without pitch and yaw vanes, Aeroprobe’s Air Data probes save weight, reduce the risk of failure, and risk of damage. Calibrations define the relationship between the measured probe port pressures and the airspeed and flow direction. The probe is placed in a known flow field and rotated to 500 discrete calibration points per calibration Mach number. Our calibration wind tunnels are thoroughly characterized free jets, configured to allow continuous flow from 5 m/s to supersonic speeds. The μADC is a compact microprocessor-based embedded computer specifically created for real-time air data measurement. Designed for use with the Air Data probe, the μADC acquires pressure and temperature measurements from the probe, applies the aerodynamic calibrations, and sends the processed data to a digital output stream and/or logs the data internally. GPS and INS integration is available for complete state-space quantification. At 135 grams, the μADC is about the weight of a cell phone and draws as little as 2.1 Watts. This product is the lowest weight, smallest package, lowest power air data system available on the market. Aeroprobe offers on site support for flight-testing or system installation. Contact us today to learn more about our Micro Air Data Systems.